This question breaks my heart. But rather than tell you about what I think, let me answer everyone by introducing you to Teresa. Teresa is a wife, mom, and elementary school teacher. For years, she suffered with the frustrating symptoms of IBS – bloating, gas, and alternating constipation and diarrhea – as well as hormonal issues, her entire adulthood. But then, last year, Teresa took a stand against feeling bloated and gassy every time she ate, running for the bathroom, unwanted weight gain, and hormonal issues by joining Solving Leaky Gut. 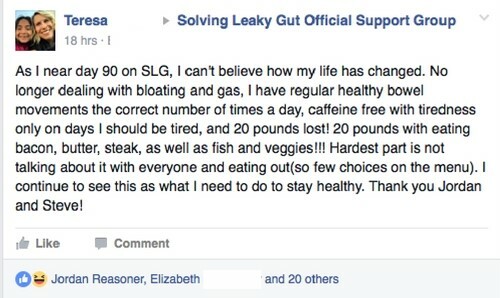 And six months after starting our Solving Leaky Gut program, her IBS symptoms are a thing of the past. Her hormones are improving AND she’s lost weight effortlessly. To everyone who thinks they aren’t “sick enough” to be ready for a program like Solving Leaky Gut – you don’t have to settle for a life of suffering. 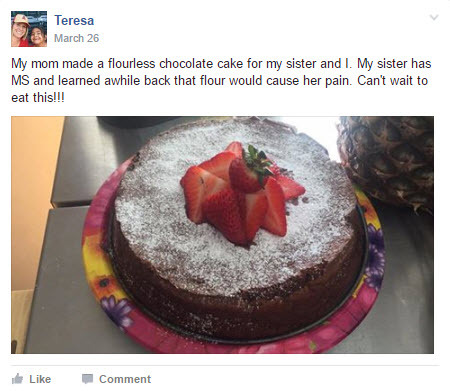 You deserve to feel great, like Teresa does now. I decided I needed to do something because those instances of constipation were followed by bouts of diarrhea. I went to the doctor where I was quickly diagnosed with a classic case of IBS according to my physician. He prescribed me medication to help with the pain, but when I read the side effects, constipation was one of them. Wait! Isn’t that why I was in pain? I only used the medication a few times before I realized I needed to find another answer to my problem. I was noticing that soda seemed to give me problems, too, so I started by adding more fiber by using Fibercon and removing soda from my life. I began exercising on a more regular basis as well to help with the stress. All of these things helped, and I was fine for years. I started to notice I was becoming bloated and gassy after eating lunch which usually consisted of a Lean Cuisine or a sandwich made with processed lunch meat. I had used Weight Watchers to lose weight, and these lunch items were easy ways to count points. I also had stress with my young daughter who was struggling at preschool. I would receive phone calls at work that I needed to come and pick her up because of a problem, and I would immediately need a bathroom. I knew I needed to change my diet, so I started eating a clean diet, but I still ate grains and nuts. I had mixed results. I felt better, and I had lost 9 pounds in a month, but I still had bloating and gas after lunch. 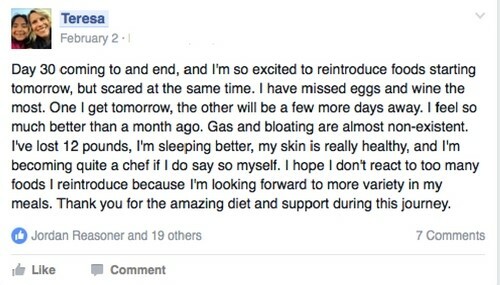 The clean eating was interrupted by the death of my grandmother and father within a month of each other causing me to not care what I was putting in my mouth, and consequently my gut. I was also taking an antidepressant at this time. I was gaining weight quickly and was back up to my weight before my Weight Watchers loss within a year and a half. Of course, the bloating, gas, and bowel problems were also getting worse. I was worrying every day about passing gas amongst my fifth graders and not making it to the bathroom at recess, lunch, and after school in time. I knew something wasn’t right with my gut, and then I found the Solving Leaky Gut website. I couldn’t afford all of the supplements, but I felt I had to do something. I simply could not continue to struggle, though, so I started with the Constipation Protocol Supplements and the diet. Getting started on SLG was a little rough – it was a big transition! But I had support from the SLG community. The Facebook Support page truly helped me to see that others were struggling with similar issues, and it also showed me that I needed to take care of my problems now! 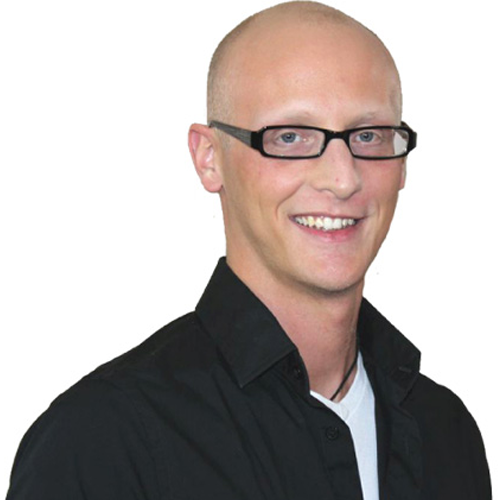 After just 30 days on the Rebuild diet, I saw major improvements in all aspects of my health. I was ready to start reintroductions. My first reintroduction of eggs was a big success, but my second try – nuts – didn’t go as smoothly. I had the group there for feedback and suggestions for what to do when I was ready to try nuts again, though. But perseverance and following the rules for reintroduction led to success after all! I even was able to begin reintroducing my favorite foods, like dark chocolate. I used techniques for relaxation and self care from SLG to better manage stress and anxiety. As I transitioned to the Living Diet, I learned how to integrate my new way of eating into my old traditions – like birthday cake! But Solving Leaky Gut isn’t just a 90-day diet – it is a new way of living. And although I don’t feel I’m completely healed, I do feel amazing. The gas and bloating are a rare occurrence, only happening when I eat something I shouldn’t. My bowel movements are between 1-3 per day, and are usually the right number on the scale. As a bonus, I’ve lost what I refer to as the “Papa Pounds,” my skin is so healthy even my facialist has noticed, and my hormones are improving. I still struggle with family and friends not completely understanding what I’m going through and why I’m not eating certain foods, but some are very supportive. I’m learning daily how to make this lifestyle work, and I’m so appreciative for this community and all of its support. 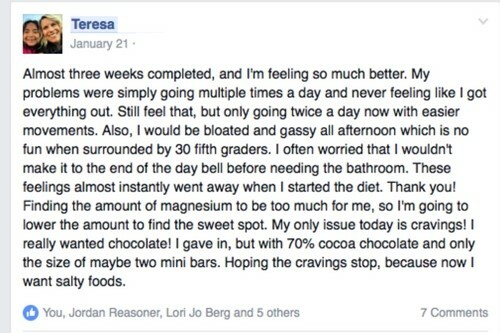 Thank you Teresa for being so candid with everyone in the Solving Leaky Gut Private Community over the last several months and for being brave enough to share your story with the rest of the world. If you, the reader, are suffering with “IBS symptoms,” like gas and bloating, diarrhea or constipation – or you have hormonal issues, unwanted weight, or fatigue – this isn’t “normal” and it isn’t “just part of getting older.” These could be the subtle clues from your body telling you to heal your gut. Ultimately, you get to decide… but I’d like to encourage you to stop ignoring the subtle clues your body is giving you. Your future self will thank you for not allowing things to turn into a life threatening situation. This brought tears of understanding… So happy for you Teresa! I am having a ulcerative colitis flare up and 32 weeks pregnant. I’d like to start the SCD intro diet but not sure the detox side of it (toxins released into my bloodstream etc) would be very good for the baby. Can you suggest what I can do to get started on the SCD or SLG to try and get my flare up under control without being to harsh on my baby. 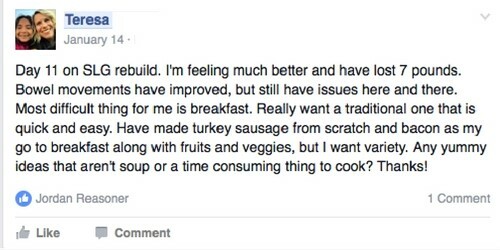 Could I skip the intro diet phase or just do the broth maybe with some veggies and meat and still heal my gut? Really appreciate some advice I’m quite stressed and don’t know how to get started. The SCD diet is safe and healthy – but we wouldn’t recommend starting the Intro diet while you’re pregnant without first consulting with your doctor. One option to discuss with your doctor would be skipping the Intro and phases for now and just eating SCD-legal foods only. What is the difference between the SLG protocol and the SCD one?? I bought and did the whole SCD protocol and although it helped a lot it was VERY hard and it seems like my whole reintroduction phase took wayyyyy longer than Teresa’s…..like month’s & month’s longer. In fact I didn’t make it completely through the last phase. I kind of dropped off and now have bloating again although I’m still careful mostly in what I eat really watching for chemicals which seems to be my trigger, I just don’t feel as good as I did. Maybe the SLG is the easier version?? 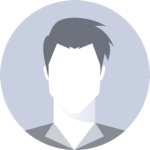 Hi Rini – thanks for reaching out! Our Solving Leaky Gut program is based upon principles of SCD as well as other healing diets like GAPs and AIP – plus it adds in lifestyle and supplement changes. It is essentially the ultimate guide to healing your gut – it takes the best practices from Steve and Jordan’s own healing journey as well as their experiences working with thousands of people one-on-one AND the expertise of a team of researchers.